Assignment #1, Due Thursday, September 21. Assignment #2, Due Thursday, October 5. Assignment #3, Due Tuesday, October 17. Assignment #4, Due Tuesday, October 31. 9-7-2K Basics of Computer Design. Performance Measures. 9-12-2K Instruction Set Architecture Characteristics and Classifications. 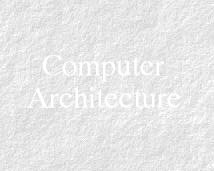 CISC vs. RISC, The DLX Architecture. 9-19-2K Data Hazards, Control Hazards, Static Branch Prediction, Compiler Pipeline Scheduling, Instruction Pipelining and Exception Handling. 9-21-2K Floating Point/Multicycle Pipelining, Exploiting Instruction-Level Parallelism (ILP): Loop Unrolling, Classification of Instruction Dependencies, Loop-Level Parallelism (LLP) Analysis. 9-26-2K Dynamic Hardware-Based Instruction Pipeline Scheduling: The Scoreboard, The Tomasulo Approach. 9-28-2K Dynamic Hardware-Based Branch Prediction Techniques: Branch History Table (BHT), Correlating Two-Level Dynamic Branch Predictors, Branch-Target Buffer. 10-3-2K Multiple Instruction Issue, CPI <1 Approaches: Superscalar, VLIW. Speculation: Software, Hardware. ILP Compiler Support, GCD Test. 10-5-2K The Memory Hierarchy. Cache Design Considerations: Organization, Replacement Policy, Write Strategies, Performance. 10-24-2K I/O Sub-System Design Considerations: Disk Storage Parameters, Bus Characteristics, I/O Performance Metrics, Queuing Theory Modeling of I/O. 10-26-2K Redundant Array of Inexpensive Disks (RAID), I/O Benchmarks, ABCs of UNIX File Systems, A study of UNIX File I/O Perormance. This page is 22Kbytes long and was last modified on: Monday, 25-Feb-2008 17:13:37 EST.